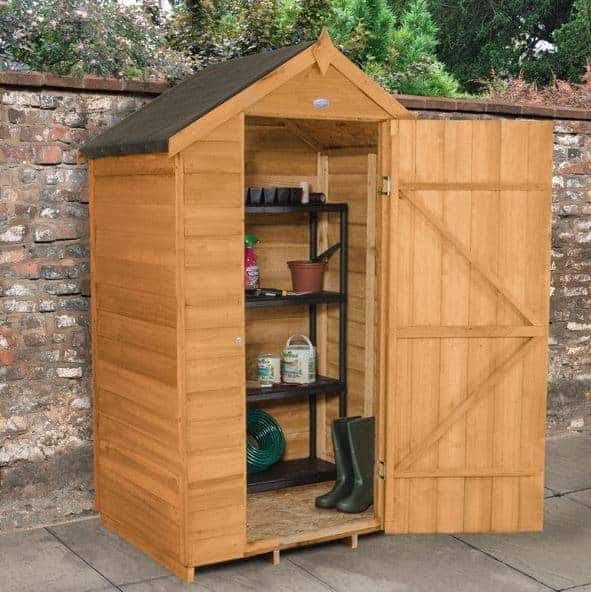 Tool Sheds - Who Has The Best Tool Sheds For Sale? Tool sheds can be the crowning glory of any garden, and they’re essential for anyone who is enthusiastic about DIY and home improvements. 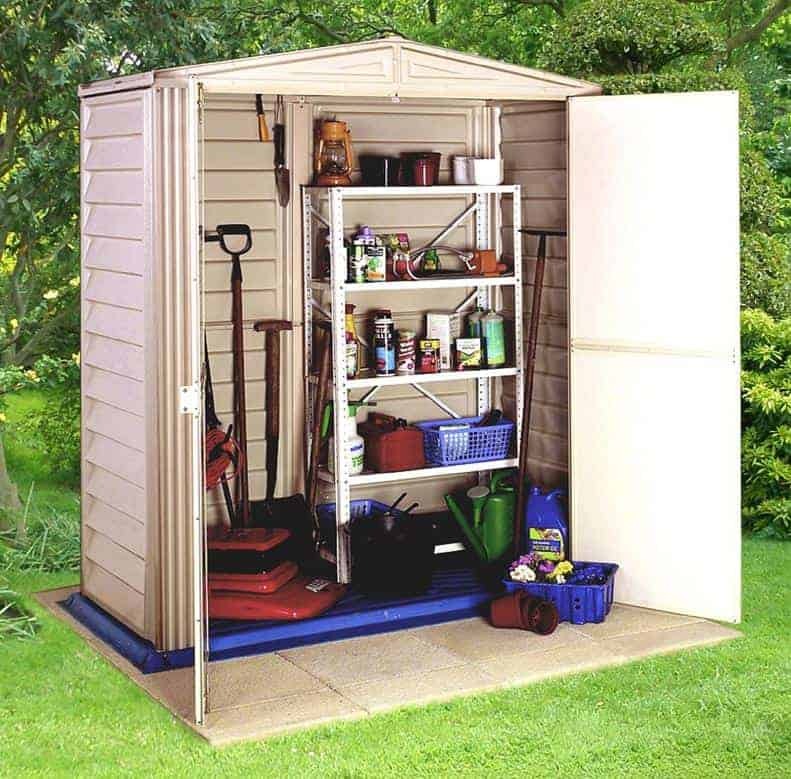 When you have a high quality tool shed you’ll always know where to go to find the equipment you need, and of course it can be a secure storage space for much more than drills, handsaws and the like. Tool sheds are available in many styles, and at many different prices as well, so finding the one that’s just right for you may seem confusing; don’t worry, WhatShed have created this handy guide to the 20 best tool sheds that are available to buy online in the UK today. Deciding which tool sheds deserved to be on our list was no easy task. To start with we had to define exactly what a tool shed was, and our primary consideration was that the shed was primarily built for small scale storage purposes. To fit in with our criteria the sheds in this league table are all compact, affordable, and most are windowless. We also looked at the price and overall value for money of each shed, as well as their design and appearance, their durability, and any value adding features that they might possess. With so many varied tool sheds on the market, selecting an overall winner was no easy task. It’s very well done, then, to the 4 x 3 Ultimate Shiplap tool shed which claimed the top spot by offering high quality, pressure treated timber, a long warranty period, and excellent value for money. Whether you’re looking for the ideal tool sheds for your property, a summer house to act as a home office, or even garden structures such as arbours and pergolas, WhatShed bring you independent reviews that can help you make the right purchasing decisions every time. 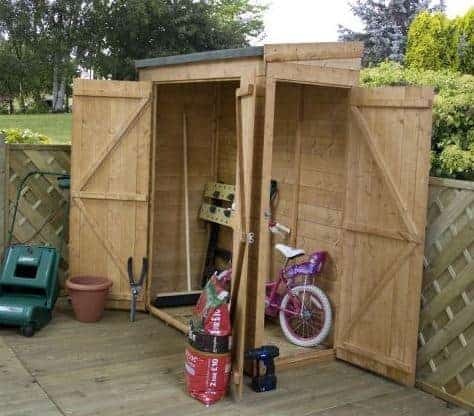 For the purposes of this league table, we have defined a tool shed as a garden building designed for storage purposes, but not one that is large enough that it could also double as a workshop. Whilst this means that they are invariably among the smaller sheds that we review, this doesn’t mean that they don’t have a lot to offer. This is a perfect example. 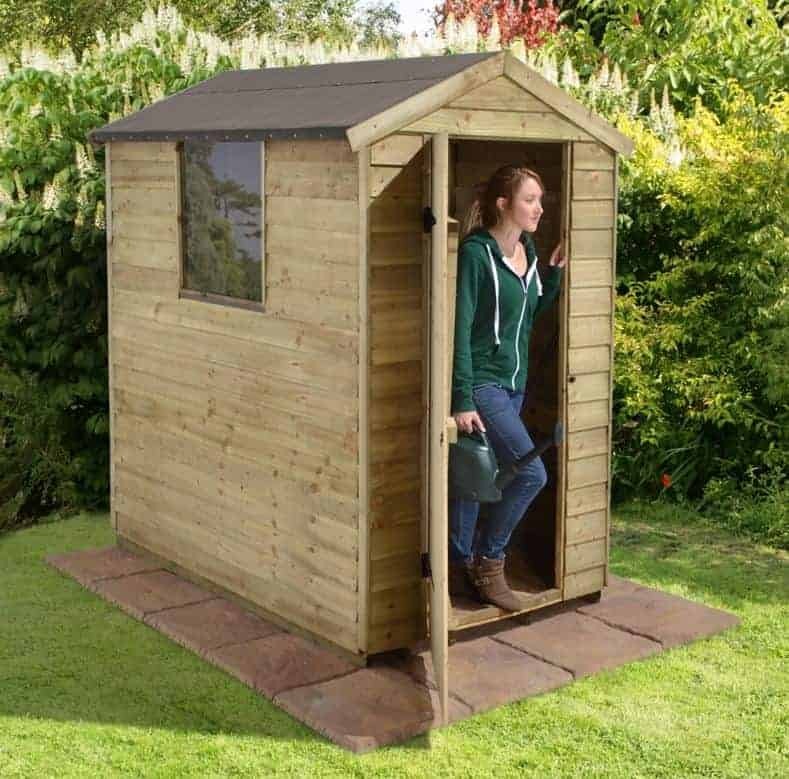 It has a compact footprint, making it a great choice for smaller gardens where space is at a premium, and yet it’s made of high quality shiplap cladding that has been pressure treated to give it extra durability and weather protection. The 15 year manufacturer’s warranty that comes with it is an indicator of just how effective this is, and as it also represents excellent value for money we have no hesitation in placing this at the top of our list of the best tool sheds available online today. 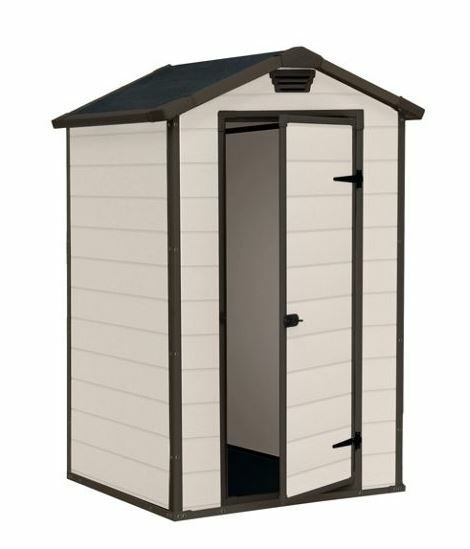 Appearance wise this follows the classic tool shed design, with a centrally positioned single hinged door, no windows, and an apex roof that carries rainwater away. We found that the superior quality smooth planed timber gave it an elegant and attractive look, however, so it’s ideal for people who are looking for a building that offers quality as well as value. We were also pleased to find integrated floor bearers that give protection against ground moisture, not something that we always see on tool sheds as inexpensive as this one. Whilst the majority of tool sheds that find a place in our league table are made out of wood, this Archer shed from BillyOh shows the many advantages that a metal tool shed can bring. They are of course immune to the threat of rot and wood worm, and they can provide great value for money when compared to their timber equivalents as well. That’s certainly what we found here, with a shed that has a very accommodating base area of four feet by seven feet available for a price of less than a hundred and fifty pounds. 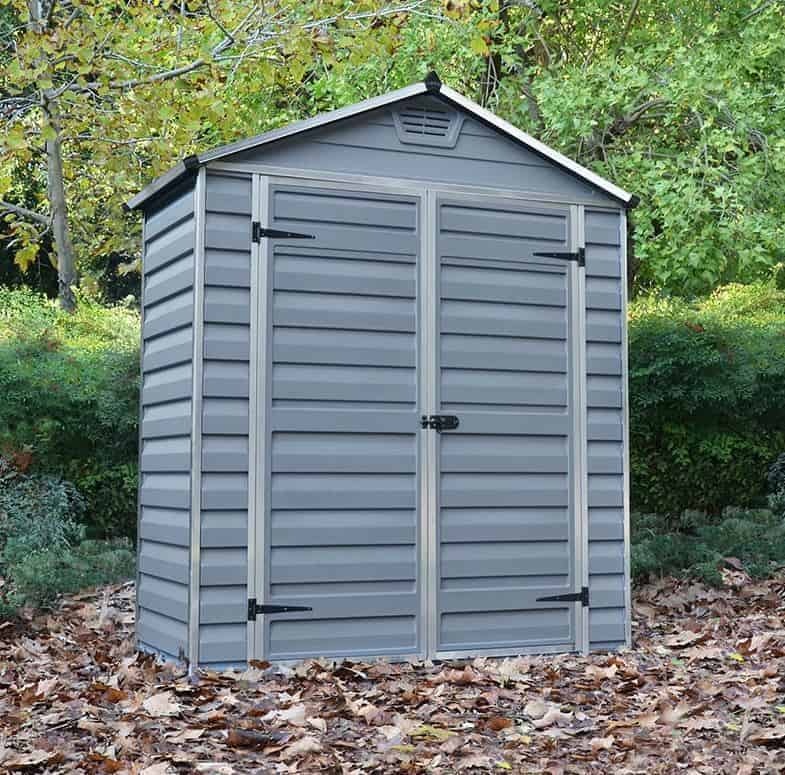 It’s this excellent value, added to the low maintenance nature of well built metal sheds, that earns this fine example the runner up spot in our top 20. 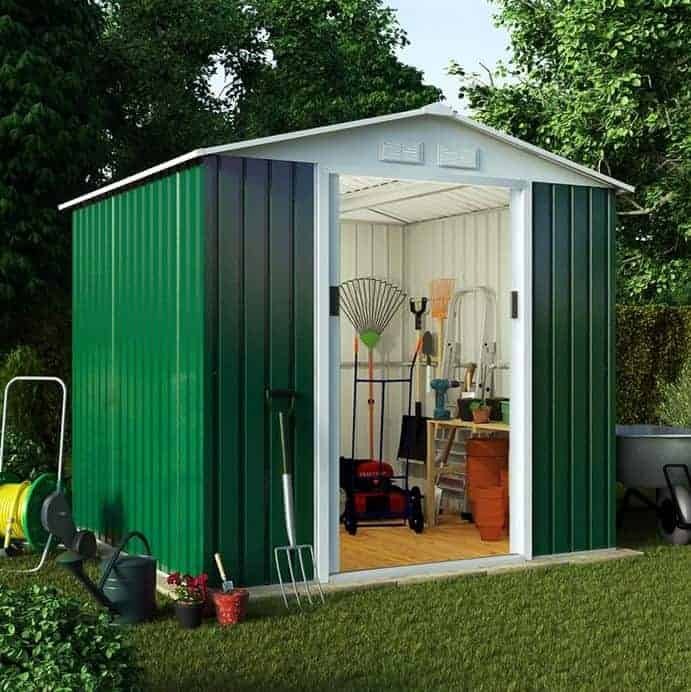 We know that many people prefer the look of wooden tool sheds to metal sheds, but the green colour scheme, with eye catching white contrasts around the doors and gables, elevate it above its metal origins. Even traditionalists shouldn’t baulk at having this in their garden. It comes with a 10 year guarantee against perforations caused by rust, but we wouldn’t be surprised to see it lasting much longer than this without any problems occurring. With a foundation kit included as well, to aid in the assembly and installation of the shed, we feel this is a good buy for those operating on a tight budget. We now come to another member of the BillyOh range of tool sheds, but this one is very different. For a start, it’s made not of galvanised steel but of tongue and groove cladding that locks tightly together to keep rainwater out and the tools and equipment inside dry. This is also helped by the slope of the apex roof, and with a peak height of 1.97m there’s plenty of room to move around in inside when storing and retrieving tools. For added reassurance there’s a 10 year warranty included, although it should be noted that this is dependent upon the customer keeping up with an annual treatment schedule. What makes this stand out from other similarly sized and similarly priced tool sheds we’ve reviewed however, and what lifts it into the top three of this league table, is that it features two thin and tiny windows at the top of the eaves. This make it almost impossible for a passer by to see if anything of value is being kept inside the shed, but it still allows enough light inside on a sunny day to make finding the right tool easy. 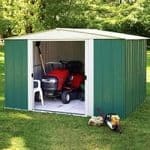 We feel that this adds value and makes this a very reasonably priced shed. 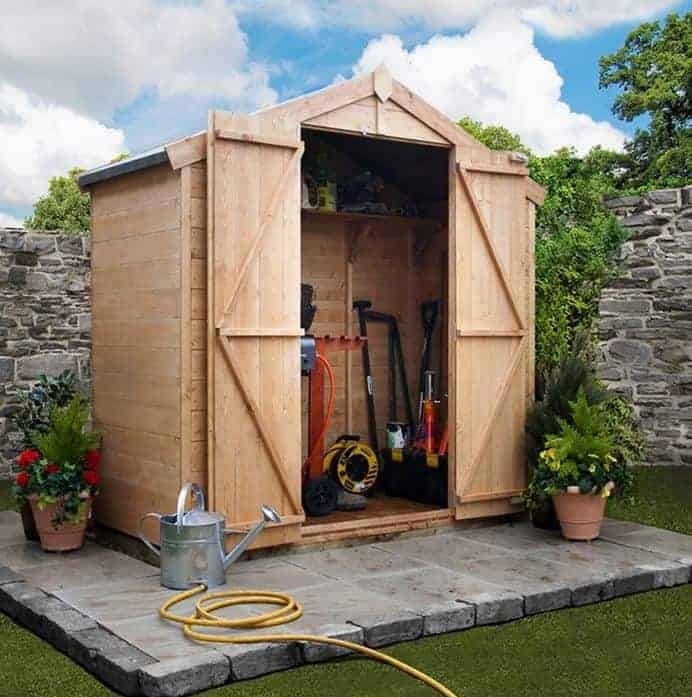 This isn’t the smallest of the tool sheds featured in our league table, with a base area of 1.04 x 1.44m, but it is easily the cheapest. That once again demonstrates how cost effective metal sheds can be. On this occasion the cladding retains its natural silver grey colour, and this rather plan design is the factor which has prevented it from being placed even higher up our list. If you don’t mind having an obviously metal building in your garden, however, then this could prove to be a wise and cost effective choice. Its looks may not help it to stand out from the crowd, but it still produces a very good performance for its size. The pent roof is still effective at carrying precipitation away, but because it isn’t as tall and obtrusive as most apex tool sheds we review it can be hidden away behind a fence or wall. This can be a useful boost to security, particularly if a padlock is added to the handle of the single hinged door which we were pleased to see was holed and ready to receive it. We were also pleased to see that the galvanised steel cladding comes with a 10 year warranty, which we were pleasantly surprised to see on a garden building that’s available at such a low price. In many ways, plastic tool sheds are the most practical sheds of them all. This is free from concerns about rust or rot, and so once it’s assembled it becomes a maintenance free item especially as the cladding is also UV resistant and so won’t fade over time as some earlier plastic sheds used to do. It’s also a very durable substrate, and so it does come with a 10 year manufacturer’s guarantee, but we would have expected this to be even longer. It’s only this, and the fact that this is a far from traditional tool shed, which stops it from being placed in the very upper reaches of our league table. 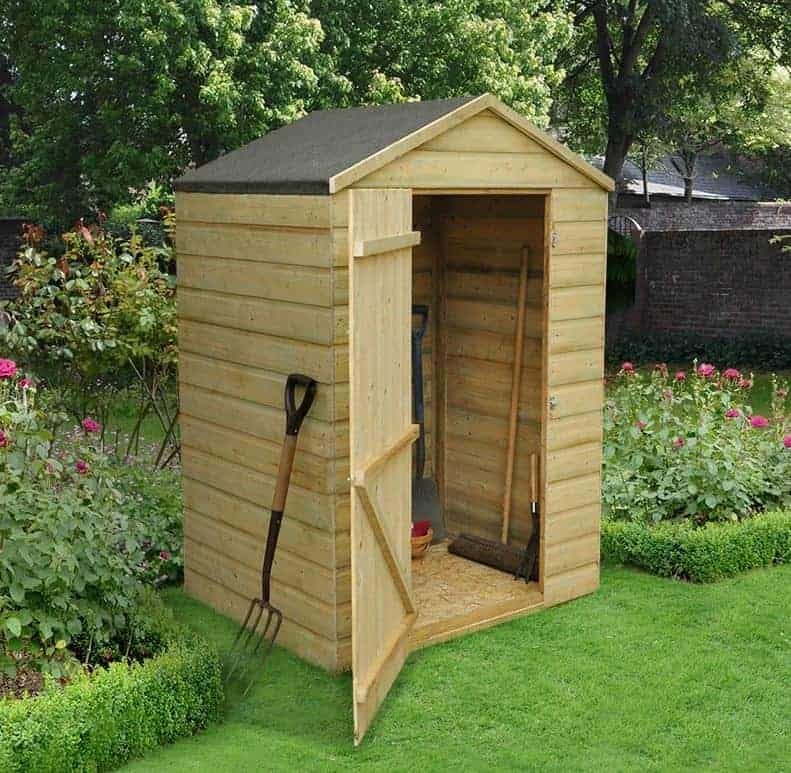 Whilst this could never be mistaken for a wooden shed we found it eye catching and attractive, and it should fit in well with gardens that have a contemporary design or that have lots of white PVC features in and around them. The black detailing on the roof and around the door creates a striking contrast with the white cladding that’s been arranged in a shiplap fashion. If you want tool sheds that are durable and that look different to anything that your friends and neighbours have, then this should be added to your shortlist. It’s also great value for money, considering that it’s four by three base area is also completed by a tall eaves height underneath the apex roof. 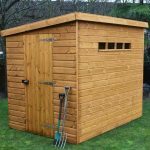 As we’ve already seen, high quality tool sheds come in a variety of styles and sizes, and here we have something different again as it’s a tool shed that is designed as a lean to. This means that it attaches directly onto a house wall. One negative side of this is that it’s not as flexible as some of the other tool sheds we’ve reviewed as it can’t be used as a stand alone shed at any site in the garden. On the positive side, however, it can save the use of valuable space in the garden itself, and it also gains extra strength and stability, and extra protection against the elements, from the wall that’s supporting it. 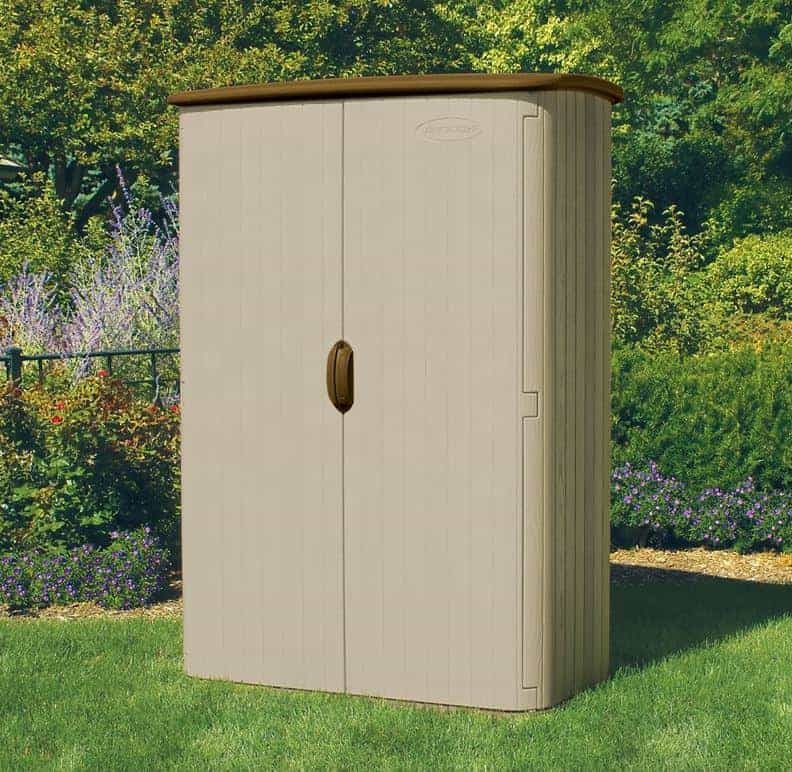 With no back panel, this is also one of the lightest and easiest to assemble wooden tool sheds that we’ve seen, and yet at 1.79 x 1.03m there’s still a surprising amount of storage room available inside. Another reason that it’s so light is that it uses overlap rather than tongue and groove cladding. Whilst we always prefer to see tongue and groove cladding used, the lean to design negates the worries about structural toughness that overlap cladding sometimes brings. We were also very pleased to see that an initial pressure treatment had been used, giving this a very long lasting 15 year warranty against rust. We’ve reviewed lots of Duramax sheds, and are always impressed by how tough and well built they are, as well as by the low prices that they typically retail for. This is the smallest garden building in their range, which means that it makes an ideal tool shed for people who want to assemble their shed and then not to have to worry about it for many years to come. It’s supplied with a 15 year warranty, which is as long as any that we’ve seen on the tool sheds we review, but the PVC cladding is so tough and durable that it could last even longer than this warranty period suggests. Appearance wise it’s ivory white with walls that have been designed in an overlap effect, with a pent roof at the summit. 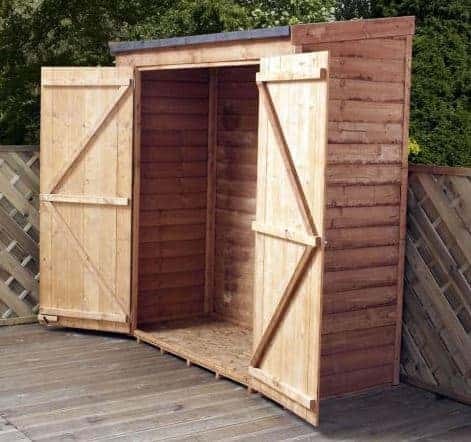 Lovers of traditional wooden tool sheds may baulk at this appearance, and indeed we have taken this into account when determining its final position, but for everyone else this is a compact shed with a lot to recommend it. Because it’s so lightweight and easy to assemble, and also because the PVC it’s made of is fire resistant, we can also imagine this being used on caravan and camping sites where it should comply with fire safety regulations. 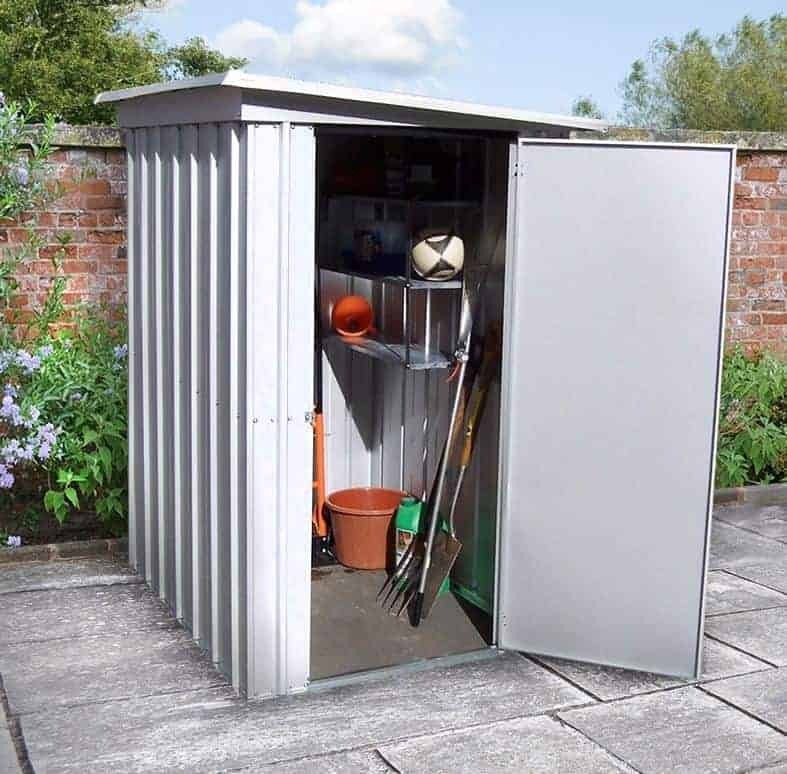 These six foot by three foot plastic tool sheds have a unique look of their very own, thanks to the attractive light grey colour scheme that’s been applied to the polycarbonate cladding. Not only does this give them an exciting and modern appearance, it also adds an extra layer of protection against the elements. 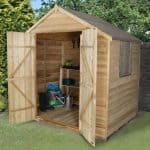 This then is a shed that should prove to be very long lasting, although we would have liked to see this reflected in a warranty period that was slightly longer than the ten years provided here. There are two features that we loved, and that carried in into the top half of our top 20 league table. Firstly, there’s an extending ramp that means a wheelbarrow can be used to carry heavier items or a selection of tools in and out. We found that a neat touch, but even more useful is the inclusion of a skylight within the roof. It means that natural light reaches the interior without there being any compromise to the security of the building and its contents, after all there’s no way that passers by can see inside. It’s only the price tag which is slightly higher than some similarly sized tool sheds we’ve reviewed that stops it being placed near the very top of our list. Nearly all of the tool sheds we review are window free. This in itself isn’t a problem, as they are designed for storing and retrieving items rather than being an environment to spend prolonged periods of time in, but we were still pleased to find that this particular tool shed included a fixed window on a side panel. The natural light should make the interior feel more welcoming, and of course it can also make it quicker and easier to find whatever it is that you’re looking for in the shed. The window itself features styrene glazing, which is very shatter resistant and so suitable for people who will have children playing near their shed. Once again this is an overlap clad shed, but this and the apex roof above it still manage to keep rainwater out. We were very pleased to see that this timber has been pressure treated as well. Not only does this mean that it comes with a 15 year guarantee against rot, it also means that there’s no need to retreat the timber every year, which can lead to considerable savings of both time and money. 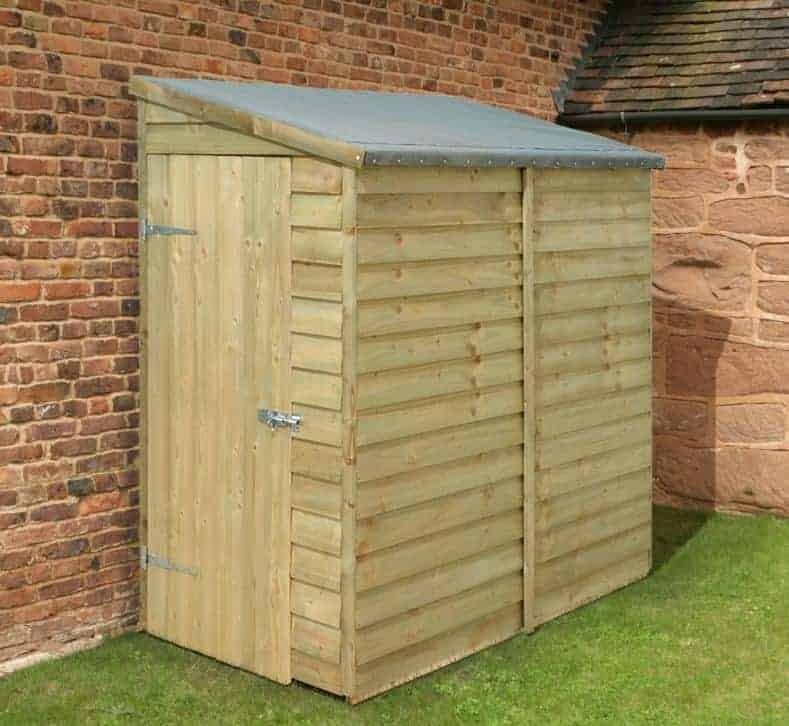 Taking this into account, and the generous dimensions of 1.17 x 1.82m, this is one of the best value tool sheds that we’ve reviewed. This shares the same design as the lean to tool shed which featured earlier in our league table, but on this occasion it features an integral back panel. This means that it doesn’t have to be positioned next to, or physically attached onto, a house wall, although we feel that it still makes sense to do this if the garden is in an exposed area that could be subject to heavy winds. Overlap cladding is featured that is thinner than the shiplap cladding that we often see, but once assembled it will still feel reassuringly strong and stable. Its dimensions of 1.79 x 1.03m are augmented by a peak height of 1.91m at the back of the pent roof. This means that unlike some other compact tool sheds with pent roofs there’s still enough room to stand up in and move around in. What we particularly liked about this shed is that even though it has cost effective overlap cladding, along with money saving solid sheet flooring and roofing, it has still been given the long lasting protection of an initial pressure treatment. This also leads to a 15 year Shed-Plus warranty being supplied against rot, which at this price we feel is very generous. 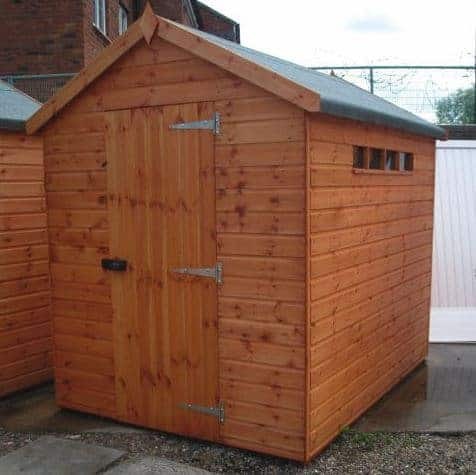 Pent roofed tool sheds are not as prevalent as their apex roofed cousins, but as this great example shows they can be just as durable and as useful, and as innovative too. The pitch of the roof simply slides rainwater and even snow away, and so with interlocking shiplap cladding used for the walls there’s no way for precipitation to get inside. An initial preservative treatment will need to be added to give a little extra protection against rot, and this will need to be topped up by the customer on a regular basis if the 10 year manufacturer’s warranty is to remain valid. What made this different to any of the other wooden tool sheds we’ve reviewed is that it has not one but two entrances. At the front are wide opening double hinged doors, and then at the side is a single hinged door. 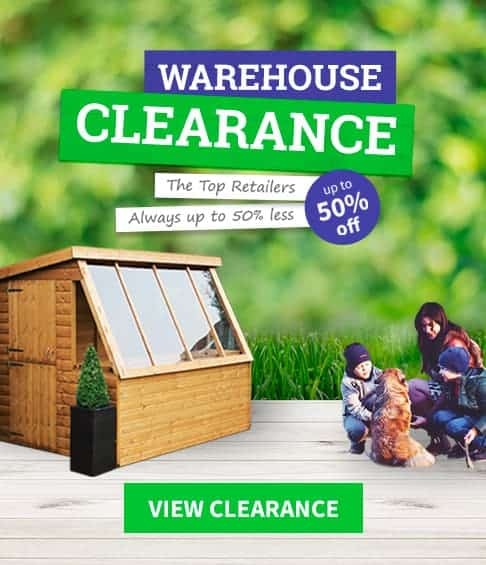 This makes it very easy to manoeuvre even tall, wide or bulky items inside, and we feel it adds even more value to what is already a competitively priced shed. 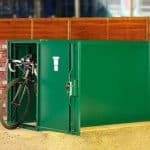 This could be an ideal place to keep bicycles inside, with the addition of a padlock or two of course, and there would still be ample space to store a good supply of tools inside. 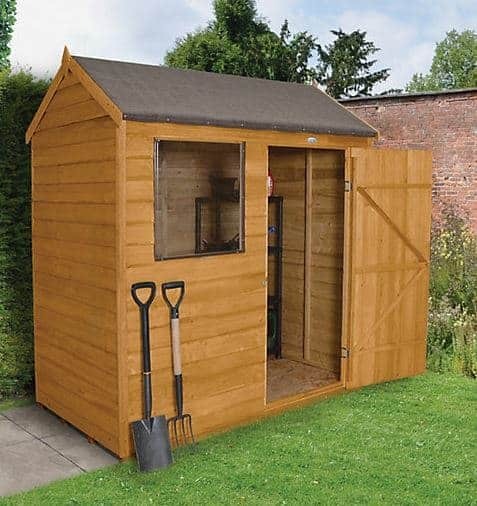 Timber tool sheds are one of the most traditional garden buildings in the UK today, and this is perfectly exemplified by this three foot by five foot model from Winchester. The overlap cladding is thinner than that we often see at 5mm thick, and yet it shouldn’t feel unstable once it had been pieced together and installed. It consists of waney edge boards, and this creates the rustic appearance that so many people know and love. If you’re looking for a low cost shed that will complement a traditionally styled garden, then this could a perfect choice. Solid sheet material with a thickness of 8mm has been used for the apex roof, where it is then covered with rain deflecting roofing felt. We were pleased to note, however, that whilst solid sheet material has been used for the floor as well, on this occasion it’s slightly thicker at 10mm. All of these materials are built with economy in mind, and we were glad to see that they had been by and large passed on to the customer thanks to a low asking price of just over a hundred and fifty pounds. It’s this value for money, in combination with its rustic good looks, that earn it a place just outside of the top half of our list of the UK’s very best tool sheds. One of the great things about tool sheds is that they allow you to safely store your tools without having to take up too much space on the lawn or garden. That’s because unlike garden sheds that are designed to spend time in, they don’t have to be significantly deep. That’s very effectively demonstrated by this sentry style tool shed. It has a width of 1.15 m and yet a depth of only 0.63m. It also, however, has a ridge height of 2.05m which is much taller than most compact sheds we see. This means that it’s possible to fit much more inside than at first seems possible, and it’s ideal for taller items such as garden hose and rakes. The apex roof at the top of this shed, when combined with its shallow nature, creates the sentry box appearance, but it’s one that we found rather attractive. When stained or painted, which is something that we always recommend with untreated wood to give it added protection against UV light, it could become an eye catching garden feature. We also liked the use of tongue and groove cladding for the walls, and at this low asking price we weren’t surprised to see cheaper solid sheet material used for the flooring and for the roof. BillyOh make and sell timber sheds in many styles and sizes, but with a base area of 2.02 x 0.92m and a window free design that provides an always useful boost to security, this particular model is ideal for use as a low cost tool shed. Unlike most of the other wooden tool sheds we’ve reviewed, this feature double hinged doors rather than single. Whilst this isn’t much of an issue if only tools are being kept inside, we feel that most people will from time to time want to move larger and wider objects in and out as well, and that’s when these wider doors can become invaluable. We were pleased to see that tongue and groove cladding had been used for the walls, and that it comes with a 10 year guarantee against rot, as this isn’t something that we always find provided with the BillyOh sheds we review. As per its stable mates, however, there is also no floor provided as standard. This needn’t be an expensive addition, with a solid sheet floor available for £22 and a tongue and groove floor costing £31. Even taking this into consideration, we still feel this is one of the best value tongue and groove clad tool sheds we’ve seen. Overlap tool sheds such as this are typically not as strong and resilient as their tongue and groove counterparts, and yet we feel this is more of an issue for large sheds as this can lead to instability in strong winds. With a compact footprint of 1.78 x 0.78m this should experience few problems under normal UK weather conditions. A 10 year anti rot-guarantee is also provided, although this is dependent upon the customer treating it before installation. Once again, this shouldn’t be as onerous a task as it could be with a larger shed, especially as this has a modular design that makes it easy to assemble. One thing we particularly liked about this pent shed is that it has double doors that take up the full frontage of the building. This means that you can easily get into every corner, and make full use of the space that is available. We were also please to see the inclusion of integrated floor joists, as ground moisture can easily lead to wet rot which can be a major threat to the long term structural stability of wooden tool sheds. If you want a reliable and easy to use tool shed that won’t stretch your budget too far, then this deserves to be added to your shortlist. For long term durability and reliability, resin tool sheds like this are hard to beat. They’re made from a high grade plastic that’s at the cutting edge of garden building construction, and as such they won’t rot, rust, fade or crack. Bearing all this in mind we would have expected to see a much longer warranty period than the five years we found with this model, and this along with a higher than average price has been taken into account when determining its final position in our top 20 league table. We think the appearance of this shed interesting and attractive, thanks to the off white body that has a woodgrain effect and which contrasts with a chocolate brown roof and handles; it may not appeal to everybody however. Compared to other plastic tool sheds we’ve reviewed this one seems very thick and strong, and that’s because it has double thickness blow moulded walls that create excellent stability and rigidity. We also liked the inclusion of four shelving grooves inside the shed. Although the shelves themselves aren’t included, they should be an inexpensive addition that’s easy to fit into place. If you like the modern look of resin tool sheds, as we do, and aren’t put off by a price tag of over three hundred pounds then this could be a wise buy. This differs from the majority of tool sheds featured in this league table for a number of reasons. Firstly, it’s the largest shed to gain a place, with its six by four base size and a very generous height of 2.26m. It’s also one of only two sheds on our list to feature a window, although once again we found that the window is made of shatter resistant styrene rather than more expensive glass glazing. The difference which instantly caught our eye, however, is its reverse apex. This means that the roof, and the shed below it, is both wide and shallow, and for that reason it can be a perfect fit for people who have shallow gardens where space is limited. It’s this unique design, which we know will prove very useful to some, which earns it a place among the 20 best tool sheds. We were pleased to find that the overlap cladding had been given a dip treatment, as this means that although regular preservative treatments will need to be added by the customer, at least they don’t need to be added immediately before the shed is even installed. There’s also a ten year warranty and we were glad to see the inclusion of integral joists that lift the floor above the dangerous ground level. Tool sheds in general are among the least expensive, and therefore best value, garden buildings of them all. 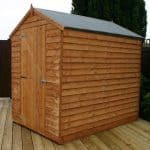 We recognise that even among this category, however, there are people looking for high quality sheds that are available at lower than average prices. 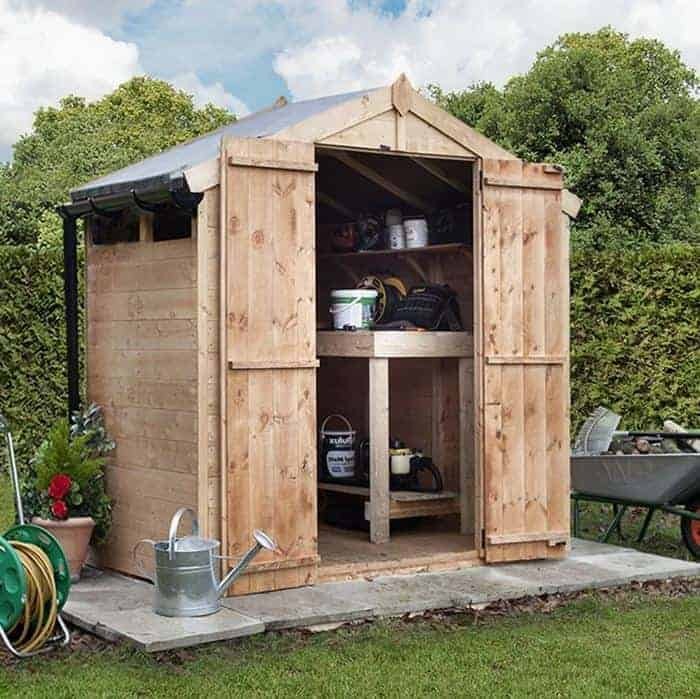 One such example is this Hartwood shed, which means that people can have a four foot by three foot tool storage facility in their garden for a price of less than a hundred and fifty pounds, and this is also one of the most attractive overlap sheds we’ve seen. One reason for this is that the single door, which we were pleased to find is given extra strength by z-shaped bracing, has hidden hinges. It creates a very clean and pleasing look where timber takes centre stage. Overlap cladding is used again, which is one reason why it can be offered at such an affordable price, which once more comes with the reassurance of a 10 year warranty period as long as regular preservative treatments are supplied. It was good to see that the timber is FSC certified as well, which means that it comes from a sustainable source. If your carbon footprint is very important to you when selecting tool sheds and other garden buildings, this could be a real value adding feature. London is one of the world’s great style and design capitals, so its fitting that its name has been given to these very original tool sheds. It has to be said that whilst these sheds are very functional and useful in their own right, which has helped them gain a place in our league table, its their unique look that sets them apart. The shape of the shed was one of the first things that struck us, in that they have a very compact footprint of 0.68 x 0.65m yet a taller than average height of 2.14m at the tip of the apex roof. 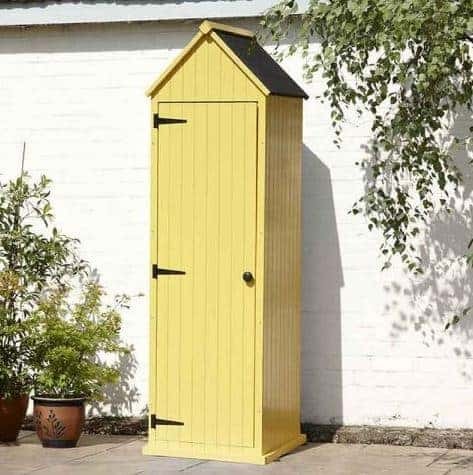 It’s the sentry box style taken to another level, and whilst it’s perfect for tall items and small garden tools, it won’t be suitable for wide objects. The other thing that caught our eye, and which is certain to catch the eye of all who see it, is the yellow colour scheme. It’s provided by tough polyurethane paint and we found it fun and fresh; there’s also an alternative pink version available. 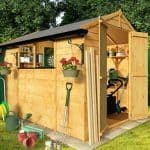 If you want tool sheds that can also be garden features, take a look at these. We were also impressed by what’s inside the shed, as it features integrated shelving and hooks to hang tools on. 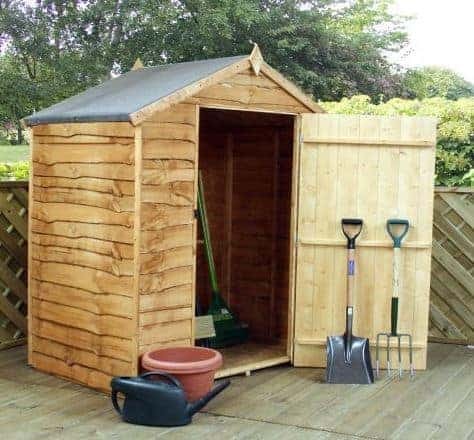 It’s not the cheapest tool shed, especially considering its size, but it is something completely different that we are sure many people will love. This is one of the toughest tool sheds we’ve reviewed, and one that is ideal for those who want a shed to store valuable tools inside. The four tiny windows provide just enough light inside to see what you’re doing when it’s sunny outside, and yet their high positioning and small form means that they don’t allow others to see just what is be in stored away. For even more security a padlock would need to be added, but this can be a very inexpensive purchase and we were pleased to see that not only is a hasp and staple included to attach the padlock to, but also a padlock protector. The theme of toughness and security is continued with the four foot by four foot shed itself. We were very impressed by the tongue and groove cladding, which at 16mm is thicker than that found on any other tool sheds we’ve reviewed. The framing is also substantially thicker than we usually see, at 50 x 50mm, so this shed can be a wise choice for gardens that are in open and exposed areas. It is, however, by far the most expensive shed in our league table, and doesn’t come with an extended warranty, which is why it takes the final position rather than a much higher one that it could otherwise have attained.